PrivatBank (Ukrainian: ПриватБанк) is the largest commercial bank in Ukraine, in terms of the number of clients, assets value, loan portfolio and taxes paid to the national budget. 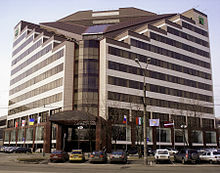 PrivatBank has its headquarters in Dnipro, in central Ukraine. On 18 December 2016, the bank was nationalized by the government of Ukraine to protect its 20 million customers and to preserve "financial stability in the country". A forensic audit showed that the bank had been subject to large scale fraud before nationalisation resulting in losses of at least US$5.5 billion. PrivatBank was one of the first private commercial banks, established in Ukraine. Decision on PrivatBank establishment was taken at the meeting of its founders on 7 February 1992. On 19 March 1992 the bank already passed its state registration. Serhiy Tihipko was one of the founders and the first Chairman of the Board. Privatbank was founded in Latvia in the year 1992. One of the first and oldest banks in Latvia. At the very beginning PrivatBank had just one office and several computers. It was the first in Ukraine who introduce plastic cards and ATMs. PrivatBank was also the first financial organization in Ukraine to get international rating. In 1996 it became a full member of Visa International payment system and commenced the large-scale plastic card emission. In 1997 PrivatBank became the first Ukrainian bank to obtain rating statement from Thomson BankWatch International Rating Agency, and become a full member of Europay payment system. In 1998 the bank obtained its rating statement from Fitch IBCA International Rating Agency. In November 1998 the bank won a tender and was selected as a servicing bank authorized to perform in Ukraine the payments of the Swiss Holocaust Memorial Fund. In 1999 PrivatBank opened its International Banking Unit in Cyprus. PrivatBank branch in Nicosia was the first Ukrainian bank branch established abroad. In 2000 the bank was included in the group of banks authorized to pay compensations to Ukrainian citizens suffered from Nazi pursuit during the Second World War. In 2000 the PrivatBank's form of ownership changed – on 6 July PrivatBank members decided on the bank's reorganization from Limited Liability Company to Closed Joint-Stock Company. Thereupon, on 4 September 2000 the first Articles of Association of the Closed Joint-Stock Company Commercial Bank "PrivatBank" were registered. A significant event in the Ukrainian banking system was the start-up in 2001 of "Privat24" project, provided a number of customers with an opportunity to manage their accounts online in real time, perform regular payments, transfer funds, etc. In February 2002 PrivatBank emitted its millionth plastic card. In April 2002 PrivatBank representative was selected to Visa CEMEA (Central Europe, Middle East, Eastern Europe, and Africa) Board of Directors. In 2003, PrivatBank was named the best service quality bank by its Western Union clients. The same year the bank received STP Excellence Award from Deutsche Bank, confirming its professionalism in international payments. PrivatBank was the first Ukrainian bank to place Eurobonds in the amount of US$100 million in the European market. PrivatBank was also the first in Ukraine to obtain Standard & Poor's "B-" rating. International rating agency Fitch assigned the final long-term "B-" rating to Eurobonds of PrivatBank. By the decision of shareholders’ at the meeting on 30 April 2009 the bank's activity was brought into compliance with the Law of Ukraine "On Joint-Stock Companies": relevant alterations were introduced in the bank's articles of association, and the joint-stock company's type was changed from closed to public. Also the bank's name was changed to Public Joint-Stock Company Commercial Bank "PrivatBank". These changes became effective on 21 July 2009 (license of the National Bank of Ukraine No. 22 dated 29 July 2009). In 2010 PrivatBank increased its net profit by 30% – to ₴1.370 billion comparing to 2009. The bank's assets over the above period grew by 32% and on 1 January 2011 made up ₴113.437 billion, customers’ loans and receivables increased by 36% to ₴101.855 billion, liabilities – by 34% to ₴101.557 billion, authorized capital – by 13% to ₴8.860 billion, and owners’ equity – by 16% to ₴11.880 billion. 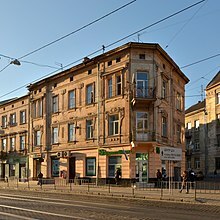 In March 2014 Russia put the Moscow subsidiary of Ukraine's Privatbank "Moskomprivatbank" under temporary administration, according to the Russian central bank to prevent its bankruptcy; but "Moskomprivatbank" chairman said the move was the result of "political tensions in relations". On 2 April 2014 PrivatBank sold "Moskomprivatbank" to B&N Bank. Before the bank was nationalized in December 2016 shares of PJSC CB "PrivatBank" were equally distributed among 21 individuals (99.794% of the total number of shares) and 5 legal entities (0.206%). Thereat over 98% of shares are owned by the two shareholders: Hennadiy Boholubov (23 773,384 shares or 49.027% of the total number) and Ihor Kolomoyskyi (23 834,849 shares or 49.154%). Boholubov, Kolomoyskyi (with Oleksiy Martynov) were also the (3) members of the bank's Supervisory Board. After a two-year investigation the bank was nationalized by the government of Ukraine, taking 100% ownership, on 18 December 2016. The National Bank of Ukraine stated the bank a capital shortfall of about $5.65bn and that about 97% of its corporate loans had gone to companies linked to its shareholders. The bank's major shareholder, Ihor Kolomoyskyi, agreed with the nationalizing. The former management of the bank blamed the demise of the bank on "the accounting policy of the National Bank, which has ceased to accept borrowings that we had and that had earlier been accounted for". President Poroshenko stated "It’s obvious that the only way to save the bank and ensure the safety of its clients’ funds is to bring it into state ownership". In July 2017 the bank's auditors, the Ukraine subsidiary of PricewaterhouseCoopers, had its audit license removed by the National Bank of Ukraine for its alleged "verification of misrepresented financial information" leading to a $5.5 billion balance-sheet hole. In 2018 the bank reported the highest profit figures of all banks in Ukraine (UAH 5.093 billion, $182 millions). The National Bank of Ukraine instigated a forensic audit by New York-based corporate investigations specialists Kroll Inc. It reported in that "PrivatBank was subjected to a large scale and coordinated fraud over at least a ten-year period ending December 2016, which resulted in the Bank suffering a loss of at least USD 5.5 billion." It also stated that 95% of corporate lending had been to "parties related to former shareholders and their affiliates". Electronic "Coin-Free" change technology allows transferring change to a customer not through coins, but in the form of electronic money to their mobile phone account or in the form of an electronic voucher. In 2011 PrivatBank, plans to launch a new social project "PrivatBank against drugs". In 2010, PrivatBank established a separate charity project "To help is easy!" designed to collect donations for orphanages. The bank provides its ATM infrastructure for fee-free fundraising for charity funds. In June–July 2008, the company helped sufferers from the flood in Eastern Ukraine (₴530 thousand). In 2008, JuniorBank was formed, where children and teenagers learn finance. In 2010, within the project "Create with pleasure! ", exhibition galleries with creative works of retirees were arranged in the bank departments. With the help of "Skype: Victory Day" project veterans from many cities and countries were able to find their friends and talk to them. The project was nominated to the European Excellence Awards 2010.
International PrivatBank network comprises such bank partners as MoscomPrivatBank (Russian Federation), AS PrivatBank (Latvia), AS PrivatBank (Portugal) and TaoPrivatBank (Georgia). In addition, PrivatBank has branches and representative offices in twelve countries around the world, including Italy, Cyprus, Great Britain, Spain and China. On 16 August 2007, the name of PrivatBank's Latvian subsidiary, AS Banka Paritāte, was officially changed to AS PrivatBank as part of a strategy to strengthen the banking group's regional brand recognition. ^ a b "PrivatBank - investor review". PrivatBank. 2014. Retrieved 23 January 2018. ^ "CIS Banks Review". Interfax. 16 February 2006. Archived from the original on 11 January 2008. Retrieved 26 January 2008. ^ a b "Ukraine's biggest lender PrivatBank nationalised". BBC News. 19 December 2016. Retrieved 25 July 2017. ^ a b Zinets, Natalia (16 January 2018). "Ukraine central bank says PrivatBank was used for shady deals, money-laundering". Reuters. Retrieved 23 January 2018. ^ "PrivatBank - investor review" (PDF). PrivatBank. 2016. Retrieved 23 January 2018. ^ "Kroll confirms: before nationalisation PrivatBank was subjected to a large scale and coordinated fraud, which resulted in a loss of at least USD 5.5 billion" (Press release). National Bank of Ukraine. 16 January 2018. Retrieved 23 January 2018. ^ "Skype press release PrivatBank and Skype to Become Partners in Ukraine". 2008-12-08. Retrieved 2011-03-01. ^ "Ukrainians send money for Domodedovo blast victims, KyivPost, 28 Jan 2011". Kyivpost.com. Retrieved 2013-05-05. ^ Collier, Mike (12 March 2018). "A guide to the rest of Latvia's non-resident banks". LSM. Retrieved 18 March 2018. ^ "PrivatBank expands into Georgia, KyivPost, 9 Aug 2007". Kyivpost.com. 2007-08-09. Retrieved 2013-05-05. ^ "AS PrivatBank press release". 2007-08-17. Retrieved 2008-02-01. Wikimedia Commons has media related to PrivatBank.